Yesterday was National Elephant day here in Thailand and in a nice coincidence research was recently published showing that these amazing animals are even more intelligent than we thought. Work done in Africa shows they can identify the aggressive voices of young men of hunting age, knowing they should fear them, distinguishing between their voices and those of women and children from the same tribe, who pose no threat. Now we guess it would be the same for the Asian elephant and in case you were wondering how to tell the difference between the species, check out the tusks, head shape and their ears. The female Asian elephant has no visible tusks, and all Asian elephants have a heart shaped dent in the top of their heads and smaller ears with which to fan themselves to keep cool. Elephants used to be found all over Thailand, domesticated over hundreds of years to live in some level of harmony with people, but these days there is less call for a working elephant. You no longer need one to ride into war – not even for a film, nor to work as beasts of burden in the forestry industry, they are no longer commonplace, an anachronism in the modern world. Good elephant camps, although not perfect, are one of the few places left where humans and elephants can work together rather than being in conflict. Koh Chang means elephant island, (koh, island, chang, elephant). No one seems to know for sure why, there is even a crazy tale which involves an elephant swimming over from the mainland. Boringly, the name most probably refers to the island’s size, but we like the slightly more fanciful idea that it is because of the shape of the right side of the island, as you approach by ferry, squint a little and you can see the head and body of a sleeping elephant. Ignoring those that might have swum here, the rest were brought to the islands from the mainland first to work and then for the amusement of the tourists, although it is sometimes hard to see what is amusing for the tourist let alone the elephant in marching along the scrubland path by the dusty main road. 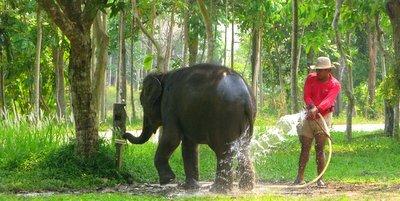 There is one place, Ban Kwan Chang, that seems to have found a better balance which works for both visitors and elephants. It’s set back into the interior, away from the road, at the edge of the jungle and is linked with the Asian Elephant Foundation. 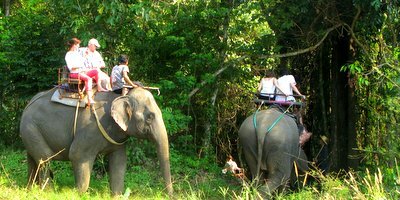 Our own first experience of riding on elephants, some 12 years ago, was slightly crazy but definitely breathtaking, high up in the spectacular area of Bolaven Plateau in Laos, far away from everyone and everything. Here on Koh Chang it’s a much more gentle, intimate affair, huge fun for kids as well as adults. You can find out about the character and quirks of your elephant and how they fit into the group hierarchy, bathe with them and help feed them, even buy a work of art painted by one of them. It is also a nice introduction to the island’s interior, you get to see more of the jungle without doing anything strenuous yourself and most importantly, the elephant seems to enjoy it too – not surprising as they get to munch on some choice vegetation as they sway with surprising grace, along the route. We organise the elephant treks at Ban Kwan Chang for you. There’s a 1hr one at 850bt or a 2hr one at 1,500bt, which includes swimming and washing with the elephants. Please contact us for full details and to reserve a place. It fills up fast.